Port Authority gets sponsors for free North Shore subway rides: "Rides on at least part of the Port Authority's new North Shore Connector subway extension will be free, under a deal announced today. The Stadium Authority and Alco Parking, which controls or manages most of the North Shore parking, would pay the transit agency an annual lump sum to underwrite free service between Downtown and the new North Side station, situated next to PNC Park." Anything but the car: The evil plan is working: "Once complete, one more pen stroke will effect an ownership transfer to private hands, and the deep-pocketed puppeteers will get what they have always wanted: Total control of all existing public transit in metro Pittsburgh. They will pay its non-union drivers miserable wages with shoddy benefits, charge you $5 to ride, and expect you to say "thank you very much" for rescuing them from the horror they have painted Port Authority." Transit Officials Look At Free Rides In Pittsburgh - News Story - WPXI Pittsburgh: "The Pittsburgh Post-Gazette reports the Port Authority of Allegheny County is trying to find a corporate sponsor to make trips free for riders between downtown and new stations on the city's North Shore." Would you like an extra $5,000 - $10,000 per year? You might be able to reduce your living expenses by reducing the number of cars in your household. Here are some services than can help. Your savings could be substantial. Car Sharing - join a car sharing company like ZipCar and get a car when and only when you really need it. Public Transit - you should join the fight for more and better public transit. You can join us and spread the news that making transit fare-free is actually cheaper than charging fares. Or at least join a transit advocacy group like Pittsburghers-for-Public-Transit and help us win more and better public transit. Pennsylvania transit-funding proposals take backseat to other issues | Philadelphia Inquirer | 10/28/2011: "Wonderling, a former Montgomery County Republican state senator who was a member of Corbett's advisory panel, said the bills by Corman and Evans "have created a dynamic . . . that the governor will have to react to." "People are crying out for decisive action," Wonderling said after the session. He said the governor and the legislature could multitask and deal with transportation funding at the same time as the other issues Schoch cited." Now that all buses have bike racks, I think it would be helpful to take a step back to look at the bigger picture. Put aside all the usual talk about bus cuts and irritation on the part of bicycle riders and drivers alike. A milestone has been achieved, one we can all celebrate. No longer must we depend on an automobile to get us where we need to go. No longer need we use a long walk from a bus stop as an excuse not to use transit. Rolling along two miles of suburban streets to get your bus has now been made worth it. That $30 weekly bus pass easily beats the $50 weekly fill-up, never mind every other cost the car racks up (pardon the pun). Using bikes and buses together makes perfect sense. Buses can't go everywhere, but bikes can. Bikes can't do hills, distances or heavy traffic easily, but buses can. Combine the two, and you have much less need to drop 10 grand every year on a (second, third) car. What drivers will now see is a lot more bicycles. This is a good thing, as many of those drivers will also be cyclists, and so be more aware of their fellow cyclists when behind the wheel. It takes study, practice and the right clothing and equipment, but getting around by bike just got a lot more attractive. Thank you to all the organizations and decision-makers who made this possible! Transit Center Coming After Years Of Waiting - News Story - WJAC Johnstown: "Local officials told WJAC they, along with the Area Transportation Authority, have been in talks over a center for six years. On Friday morning, members of the ATA and state and local officials dug their shovels into the ground for the ground breaking of the new center. “Everyone can get in and out of the weather, and they can have restroom facilities to use,” said David Gordon, of the ATA Board of Directors." Streetsblog Capitol Hill » Communities Urge Congress: “Don’t X Out Transit”: "A 30 percent cut in federal funding would mean that we would have to cut up to five of our 17 community routes. Our funding situation is already so precarious that our “neighborhood” routes only run four or five trips a day, Monday through Friday, so any further cutbacks would mean elimination of all service on these routes. - Centre Area Transportation Authority, State College, PA"
that Public transit face no more cuts! 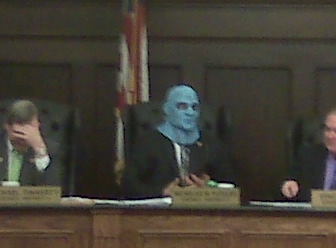 that transit service in Allegheny County be restored to pre-March 27th levels! that public transit be expanded and improved! 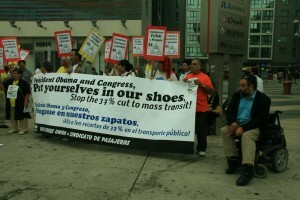 that our public transit NOT be privatized: keep public transit public! that transit be permanently and reliably funded! that our transit workers and their union be defended! 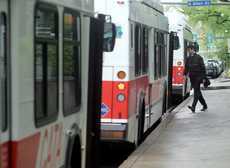 Six months ago, Pittsburgh suffered a 15 percent cut to it's transit service. More than 12,000 people around the county lost their service, dozens of routes have been eliminated entirely, and more than 180 unionized transit workers lost good, family-sustaining jobs. This cut was due to a funding crisis which stems directly from the ongoing economic collapse, bank and corporate bailouts, wars and occupations abroad, and the total unwillingness of politicians from both major parties to levy taxes on the rich. Nothing has changed since March. The Federal, Pennsylvania, and local governments are all facing budget shortfalls, and the 'leadership' of these bodies wants to present the bill for this crisis (which was caused by the rich and the bosses) to working people in the form of service cuts, fare hikes, and layoffs. The possibility of even more severe cuts in the near future remains very real. 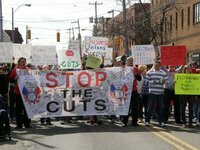 Nearly 600 people joined us in Squirrel Hill to demonstrate against the cuts last March. We need YOU to join us on September 24th to send a message: we will tolerate no more cuts to our public transit! The remnants of Tropical Storm Lee dumped enough rain on the Northeast Thursday to bring flooding and mudslides to the Philadelphia area, and officials said three people in central Pennsylvania had died as a result of the storm. Public transit pays off - Lebanon Daily News: "By taking the bus, Heilman said, people will realize it is a comfortable and stress-free way to ride. "I think many of them will be surprised at the convenience bus service offers; the freedom from the daily commute headaches; and the amenities offered on many bus lines today, including free WiFi," she said. To alleviate the worry of being stranded at work and unable to get home in case of an emergency, Commuter Services offers a free emergency transportation service that will pick up a commuter at work and drive them home, Heilman said. Riding public transit can also save money, Heilman said. She urged commuters to log onto PaCommuterServices.com and visit the Commuter Calculator page to tabulate potential savings." They keep trying to link collecting tolls on roads to public transit funding. This is totally bogus. Do not fall for it. Tolls are for rationing, not revenue. This is a divide-and-conquer scam. No Car, No Problem: Life in the Slow Lane: "In college, I decided to save money by not purchasing a car and found that I also escaped worries of shoveling the snow from around its tires, finding parking, and arguing with mechanics. Now, when parents or friends offer me their used vehicles, I turn them down, preferring to avoid the hassle of ownership." ThinkProgress » Paul Ryan’s Plan To End Medicare Stirs Anger At Pennsylvania Town Hall Event: "Yesterday, Scott Keyes reported that Rep. Paul Ryan’s (R-WI) effort to sell his budget proposal was not going over well with conservative constituents in his district. During a town hall meeting in Milton, attendees booed Ryan for rejecting the notion that the top income earners should be taxed more. Last night, Rep. Lou Barletta (R-PA) received a similarly hostile reception from constituents during a public forum in Carbon County, as he tried to (incorrectly) reassure the group that Ryan’s budget would not affect the Medicare benefits of those over the age of 55." Read more of the above Carbon County anger at the GOP Medicare plans at thinkprogress. The GOP has been taken over by the fossil-fuel industry and is now the Gas and Oil Party. They have bankrupted us with the auto-sprawl system, and now want to take away medical coverage so they will have more money to fuel traffic jams and parking lots and to fight energy wars in the Middle East, North Africa, and the Caspian Sea region. The USA is NOT Broke! There is plenty of money. It is all concentrated in the hands of a very small number of people. Study: Gas from ‘fracking’ worse than coal on climate - The Hill's E2-Wire: "Cornell University professors will soon publish research that concludes natural gas produced with a drilling method called “hydraulic fracturing” contributes to global warming as much as coal, or even more. Cornell Prof. Robert Howarth, however, argues that development of gas from shale rock formations produced through hydraulic fracturing – dubbed “fracking” – brings far more methane emissions than conventional gas production." 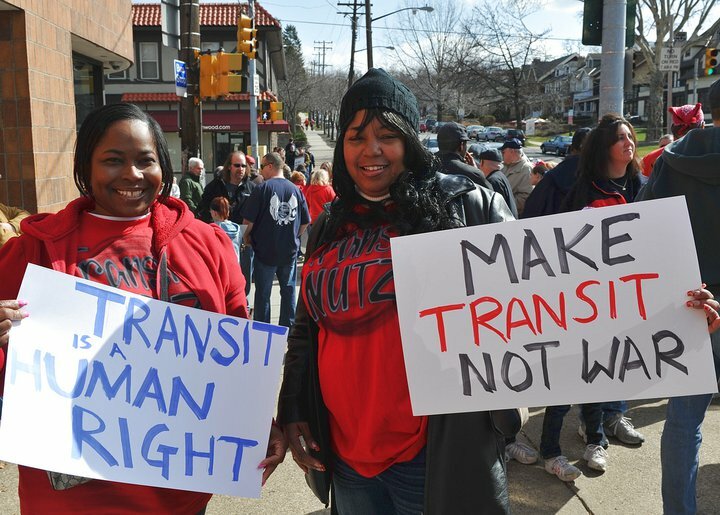 Join PPT as we discuss our next steps in the struggle to protect and expand public transit in Allegheny County. In the wake of the cuts, we need to lay the groundwork for a fight to restore our transit service and to prevent future cuts that are being prepared as we speak. We have only begun to fight! All are welcome! If you have any questions or suggestions, please e-mail SavePGHTransit@Gmail.com. CATA may go fare free - Local | Centre Daily Times - State College, PA | Penn State, Nittany Lions, weather, news, jobs, homes, apartments, real estate: "Future Centre County bus riders may have the option of showing identification instead of fumbling for change each time they board the bus. A state-funded study set to start later this year will analyze the universal access concept, which allows mass transit users to ride without paying a fare at that time." Until we’re “Blue in the Face” | Public Transit 4 Pittsburgh: "That’s right. You’ve seen him in the news, and if you haven’t you probably have heard about it by now. County Councilman Nick Futules is trying to put a halt to the upcoming Port Authority route cuts and layoffs planned for later this month. Councilman Futules represents District 7, which includes the area surrounding the Harmar garage that would close under the Port Authority plans." Allegheny County Transit Council: Why “ Public Transportation service cuts will affect only bus riders” is a myth...: "On the long term – if the study quoted by AP and Yahoo! News is even remotely correct -crude oil reserves will be depleted before an alternative energy personal vehicle will be available for the mass markets. And investors will avoid putting their money in area that do not offer multiple alternatives for their employees to commute or in other words economic growth will stagnate in areas where the main option for commuters is a personal vehicle." by @anabellebee One Perfect Day Aboard Amtrak: "There is a certain sense of companionship among train travelers …And it can lead to the most unusual discussions, such as exchanging corn-mush recipes with a Mennonite lady …or discussing about bridges with a couple traveling to Washington all the way from New Mexico. We left soon after mid-day, installed in our comfortable business class seats. 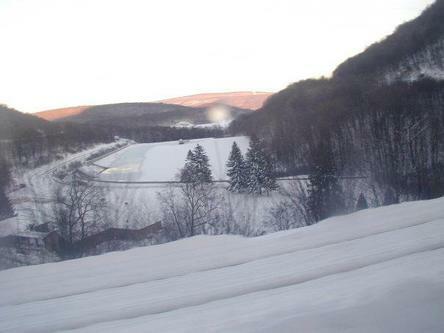 It was a very long trip, as most of Pennsylvania was still covered with heavy blankets of snow. But it did offered us the unique opportunity to enjoy the landscapes, to meet people"